The scheme takes as a starting point the ‘Boomer’ generation’s requirements in terms of wanting to live in an environment which does not set them apart from younger generations, but provides certain easy-to access facilities more akin to a serviced apartment or hotel. It is a development which is comfortable and flexible, with opportunities for being sociable and active, both indoors and outdoors. The flats are grouped into 3 or 4 storey blocks, giving the scheme a more exclusive feel and residents a greater sense of ownership for their individual buildings. 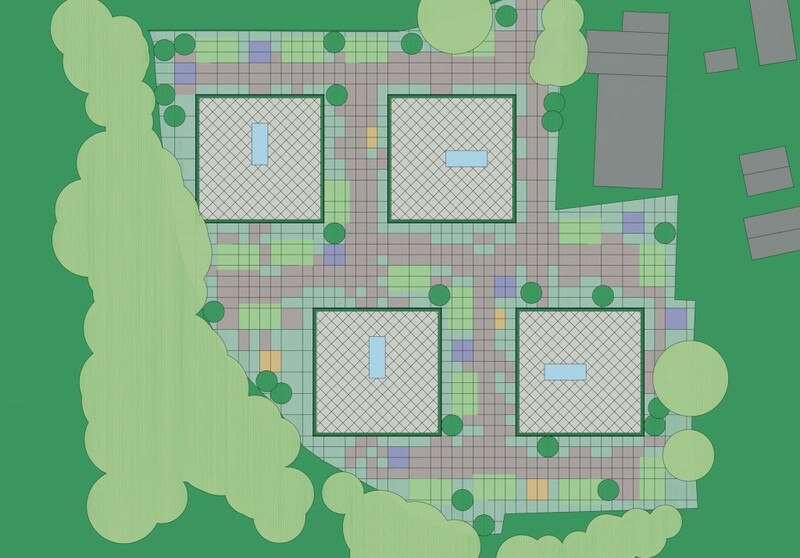 This arrangement also allows landscaping of the site so that the blocks are set within a ‘parkland’ or ‘campus’. Each block has areas of soft landscaping around it which are an extension of the more private terraces / balconies to each flat. Car parking spaces are spread out amongst the blocks, for the residents’ convenience. The landscaping and parking have ‘shared surfaces’ to visually tie the external spaces together, and create areas which are attractive to walk around, with pockets set aside for socialising. 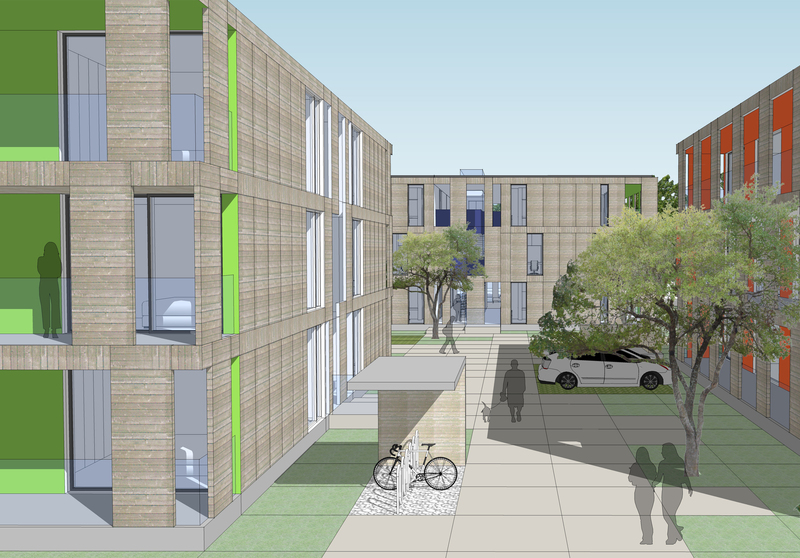 The scheme would be designed to Passivhaus standards, for long term sustainability. The ‘Boomer’ generation occupying the flats may on the whole be retired, and be more conscious of keeping outgoings low, therefore the use of Passivhaus construction methodology will enable minimal energy running costs for tenants. High thermal comfort levels can be achieved by Passivhaus construction, and a healthier living environment in terms of air quality. The blocks are proposed as being constructed with a cross laminated timber structure, clad with a lightweight dry construction – coloured cement boards and timber framed rainscreen panels. The flat roofs would be used for the installation of photovoltaic / solar hot water heating. Each unit would have its own spacious terrace / balcony, creating an extension to the internal rooms, useful both for entertaining and giving extra space for residents who spend more time at home. 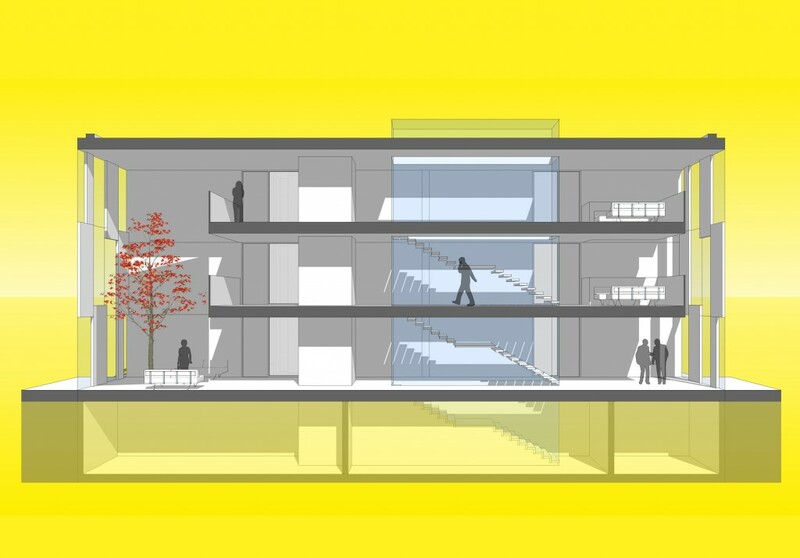 Each block has generous common spaces, with triple height voids and natural light flooding through at all levels. The common areas provide informal social / meeting spaces, as opposed to more institutional shared living rooms. The ‘Boomer’ generation’s interest in remaining active and fit is catered for by a gym and spa facility in one of the blocks, alongside a site office for management of the development. There would be a centralised intranet / wifi system, enabling easy and quick access to the web by residents. 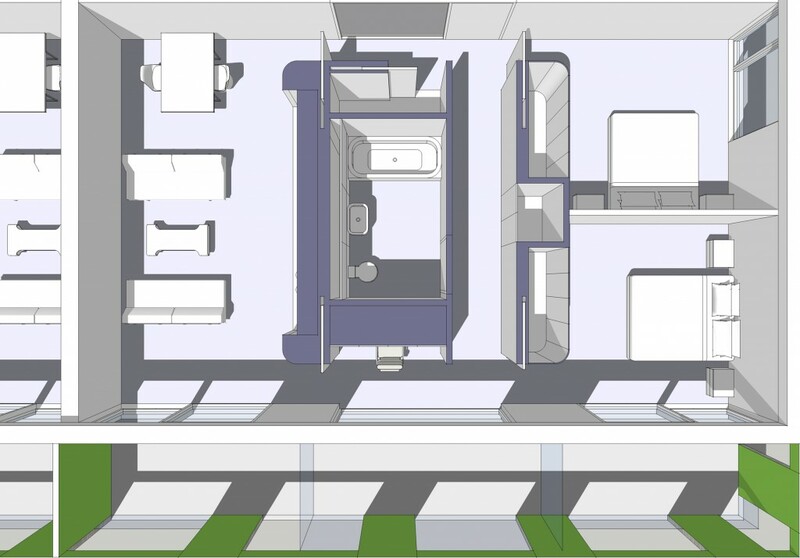 Each unit type is envisaged with a central ‘pod’ which houses all services, kitchen zone, built in storage, doors, home office and bathroom. These could be prefabricated and customised according to client choice from a ‘menu’ of adaptions available. Doors sliding into the pod provides an open plan feel when all open. Unit and room sizes can be customised, larger or smaller according to site size and shape and affordability.